The Vertical Ball Rebound Tester is used for analysis of the bouncing characteristics of an artificial turf surface. 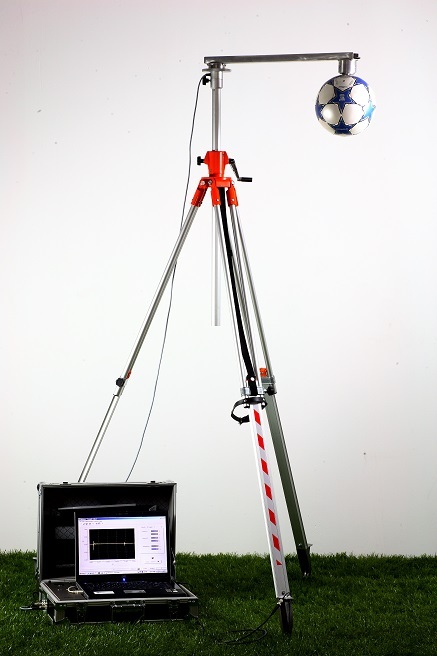 The tester releases the ball from a height of 2 meters, after which the height of the rebound is registered. A sensitive microphone measures the time between the first and the second impact. The supplied software calculates the rebound height from this time period according to a formula that is prescribed by the FIFA. The Deltec Vertical Ball Rebound Tester is a mobile and robust measuring instrument distinguishing itself by its user-friendliness. External influences on the measurements are minimised by releasing the ball by means of the software. The Vertical Ball Rebound Tester is used in the field and does not rely on external power supply as it has a built-in 24V battery in the DAD case. The drop mechanism is user-friendly and easy to move. The DAD case can also be extended with our Artificial Athlete, the Triple-A and the SKID Tester.